Vanilla poached pears filled with a praline emulsion and served with spiced shortbread and a chocolate sauce. For the biscuits: preheat the oven to 180°C. Mix together the sugar, flour, soft butter, gingerbread spice and egg yolk. Combine well to form a biscuit dough. Place six individual tart moulds on baking sheet lined with a silicone baking mat. Press the biscuit dough into each of the moulds, transfer to the oven and bake for 15 minutes. For the pears: place the water, sugar and split vanilla pod in a large pan and bring to the boil. Chop off the base off the pear to create a flat base. Use a corer to make an incision around the core but don't actually remove the core at this point. Add the pears to the pan and cook over a low heat for 20 minutes or until the pears are soft. Remove from the pan and allow to cool. Once cool, cut the top of the pear off (about two thirds up from the base) and push out the core. For the emulsion: mix together the praline and cream and then pour the mixture into a siphon. Charge with a gas canister and then chill in the fridge until ready to serve. For the chocolate sauce: break the chocolate into small pieces and place in a bowl. Bring the milk to the boil, pour onto the chocolate and then stir gently until you have a smooth and glossy mixture. 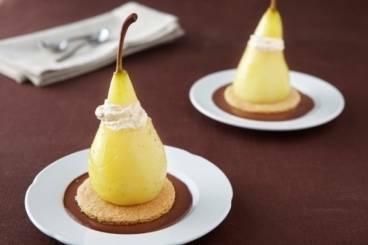 To serve: place a pear on top of each spiced shortbread. Use the siphon to fill each pear with the praline emulsion. Replace the top of the pear and then pour over the chocolate sauce to serve.